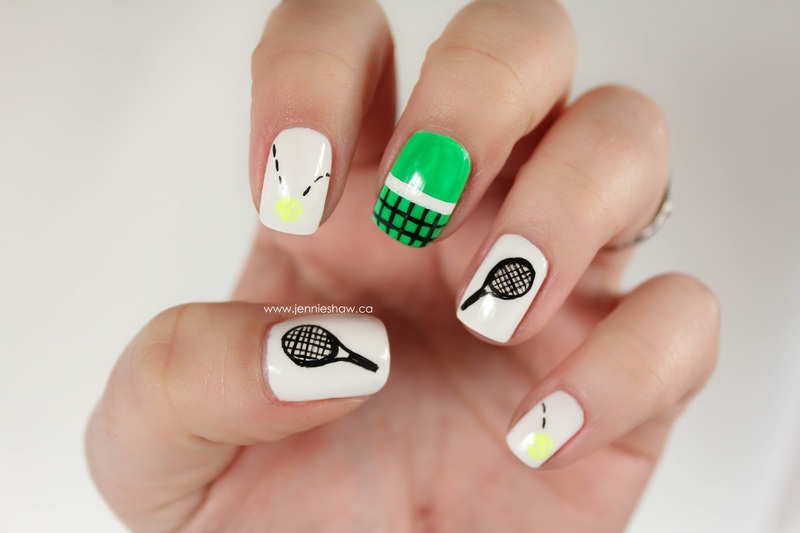 jennie's nails and tales: the nail files: tennis, anyone? For our second week in Neon Month Amazingness, I was inspired by one of my all-time favourite handbags. Kate Spade has the funnest designs ever, so when I saw this tennis ball bag a few years back, I just had to have it. Because, neon yellow patent leather. I can't believe how well my idea turned out (isn't it just the BEST when that happens?! ), so I took about a bazillion pictures and even dug out my old tennis gear for props. But because I love you, I'm only sharing a few because otherwise, you'd be scrolling through pictures all day. To start, I let two coats of Paper Mache dry completely. Then, I did two coats of Kiwi Cool-ada on my middle finger and let that dry. Now, I didn't have to use a white base for Kiwi Cool-ada, because it's pretty bright by itself, but because this is Neon Month, I wanted it to be as bright as possible. Haha! When the green was dry (which didn't take long because neons dry pretty quickly), I got out the White Stripe Rite and drew a line in the middle of my nail. I filled it out a bit and then added the black lines. To create a solid top, I then went over the white line. The tennis balls on my pointer and pinky fingers weren't made with a dotting tool, but with a small nail art brush. I did two coats of Key Lime Twist to get a nice bright yellow. When that dried, I used White Stripe Rite to draw the two curved lines (which are hard to see, but I promise are there.) and filled in the rest of the nail with black "bouncy" lines. 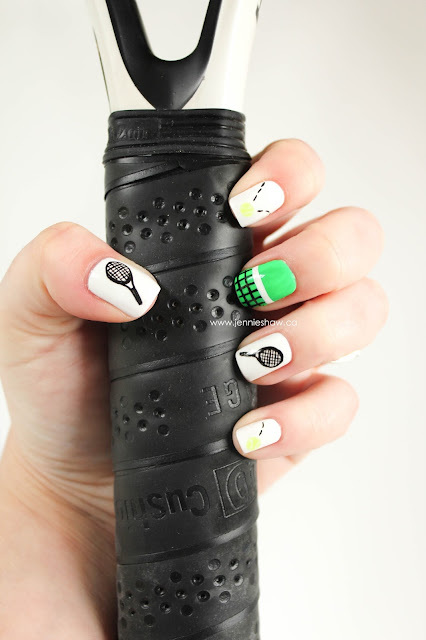 The racquets were legit the hardest part of this mani, which I'm sure comes as no surprise. Haha! I started with an outline of the entire racquet with a VERY thin line and when I liked the shape, evened it out. Then I added thickness at the bottom for the grip, and finished off with the string lines. So yeah. I love this mani. Haha! It's fun and bright and represents not only my favourite bags, but also my favourite sport. A double-win mani!! So what were you rocking this week? Were you inspired by Neon Month? Link up and show off! 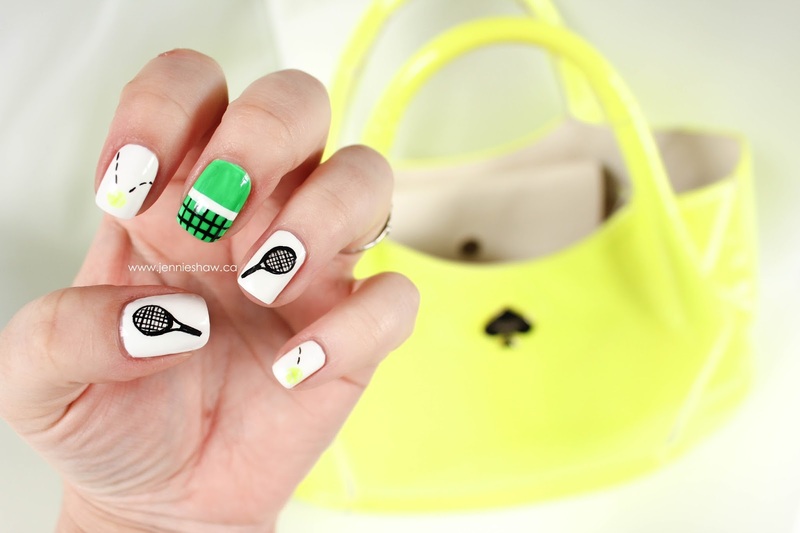 Love that bag and your tennis design! I was on my high school tennis team, probably the only sport I was decent at. This is cute. I never wear yellow. I probably should. 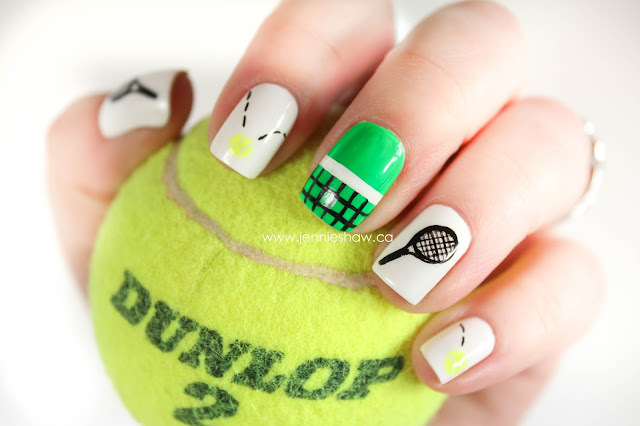 What a prefect manicure for summer time.